Cash is outdated. It takes up room in your pockets and counting out change is tiresome. Contactless payments are the future. That's why bPay is here to save the day with a variety of devices you can use to tap on card readers all along the high-street and not have to worry about counting out your notes. bPay is a pre-paid account that links up with your UK registered debit or credit card (Visa or MasterCard) and you can use it at over 300,000 locations across the UK. You just have to tap it on the contactless reader and there's no need to enter a PIN. There's a free app for Android and iOS to keep track of your spending and top up your account. The best bit is you can update your account with amounts from £5 to £200 at one time. Check out how easy it is to connect up to your mobile phone with the video below. You can use bPay for payments of £30 or under wherever you see the contactless symbol. 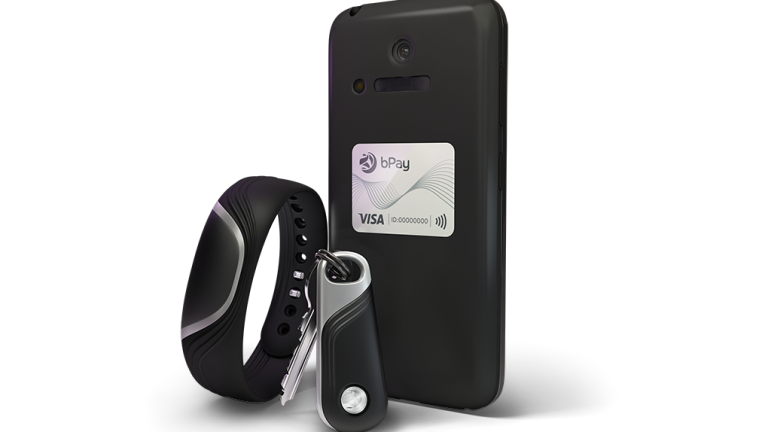 bPay has a range of devices available. You can choose a wristband, a fob for your keys or a simple sticker or maybe even one of each. Attach the sticker to the back of your smartphone or tablet, or anything else for that matter, and use it to make contactless payments quickly and easily. Prices for bPay devices are £14.99 for the sticker, £19.99 for the key fob and £24.99 for the wristband. For a limited time bPay will give you a free sticker thrown in for free when you buy any bPay device*. Offer ends 10 January 2016. You don't have to stick to one device though – up to 10 bPay devices can be attached to one bPay account. bPay is quick, as secure as Chip and PIN but even more convenient as you don't have the stress of entering a number, it's just tap and leave. It's the ultimate payment solution for those who love tech. For more details, watch the Day in the Life with bPay video below. Visit bpay.co.uk to get your hands on one now. Terms and conditions Payment functionality is valid for a minimum of two years and is subject to application and acceptance of terms and conditions. Once the chip expires, you will need to buy a new bPay device to carry on using your account. Barclaycard is a trading name of Barclays Bank PLC. Barclays Bank PLC is authorised by the Prudential Regulation Authority, and regulated by the Financial Conduct Authority and the Prudential Regulation Authority (Financial Services Register number: 122702). Registered in England No. 1026167. Registered office: 1 Churchill Place, London E14 5HP. Barclays Bank PLC subscribes to the Lending Code, which is monitored and enforced by the Lending Standards Board. *Offer valid from 9am on 15 Nov 2015 to 11.59pm on 10 Jan 2016. Free bPay sticker with every bPay device purchase (subject to availability). bPay reserves the right to amend or withdraw this promotion at any time and for any reason.